German rabbi; born at Darmstadt April 29, 1801; died at Copenhagen Dec. 3, 1891. 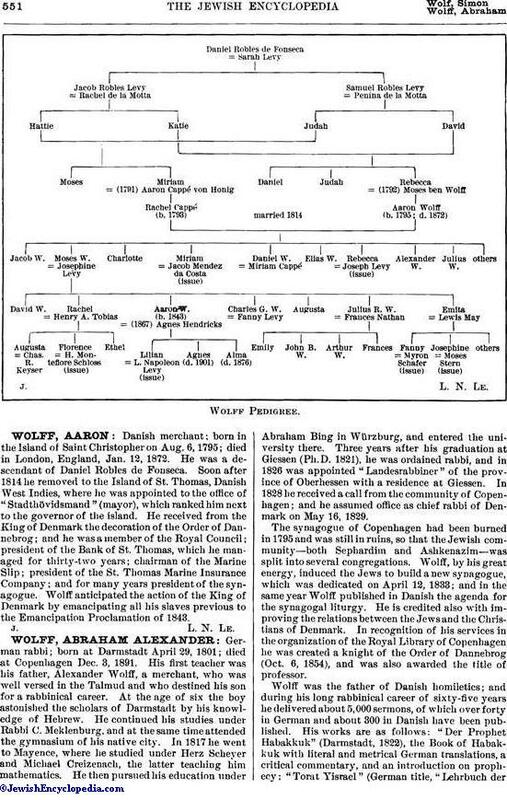 His first teacher was his father, Alexander Wolff, a merchant, who was well versed in the Talmud and who destined his son for a rabbinical career. At the age of six the boy astonished the scholars of Darmstadt by his knowledge of Hebrew. He continued his studies under Rabbi C. Meklenburg, and at the same time attended the gymnasium of his native city. In 1817 he went to Mayence, where he studied under Herz Scheyer and Michael Creizenach, the latter teaching him mathematics. He then pursued his education under Abraham Bing in Würzburg, and entered the university there. Three years after his graduation at Giessen (Ph.D. 1821), he was ordained rabbi, and in 1826 was appointed "Landesrabbiner" of the province of Oberhessen with a residence at Giessen. In 1828 he received a call from the community of Copenhagen; and he assumed office as chief rabbi of Denmark on May 16, 1829. The synagogue of Copenhagen had been burned in 1795 and was still in ruins, so that the Jewish community—both Sephardim and Ashkenazim—was split into several congregations. 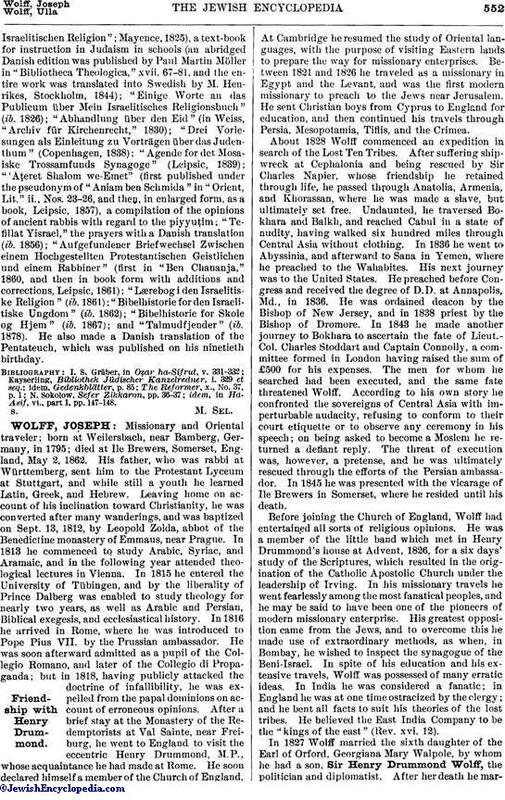 Wolff, by his great energy, induced the Jews to build a new synagogue, which was dedicated on April 12, 1833; and in the same year Wolff published in Danish the agenda for the synagogal liturgy. He is credited also with improving the relations between the Jews and the Christians of Denmark. In recognition of his services in the organization of the Royal Library of Copenhagen he was created a knight of the Order of Dannebrog (Oct. 6, 1854), and was also awarded the title of professor. Wolff was the father of Danish homiletics; and during his long rabbinical career of sixty-five years he delivered about 5,000 sermons, of which over forty in German and about 300 in Danish have been published. His works are as follows: "Der Prophet Habakkuk" (Darmstadt, 1822), the Book of Habakkuk with literal and metrical German translations, a critical commentary, and an introduction on prophecy; "Torat Yisrael" (German title, "Lehrbuch derIsraelitischen Religion"; Mayence, 1825), a text-book for instruction in Judaism in schools (an abridged Danish edition was published by Paul Martin Möller in "Bibliotheca Theologica," xvii. 67-81, and the entire work was translated into Swedish by M. Henrikes, Stockholm, 1844); "Einige Worte an das Publicum über Mein Israelitisches Religionsbuch" (ib. 1826); "Abhandlung über den Eid" (in Weiss, "Archiv für Kirchenrecht," 1830); "Drei Vorlesungen als Einleitung zu Vorträgen über das Judenthum" (Copenhagen, 1838); "Agende for det Mosaiske Trossamfunds Synagoge" (Leipsic, 1839); "'Aṭeret Shalom we-Emet" (first published under the pseudonym of "Aniam ben Schmida" in "Orient, Lit." ii., Nos. 23-26, and then, in enlarged form, as a book, Leipsic, 1857), a compilation of the opinions of ancient rabbis with regard to the piyyuṭim; "Tefillat Yisrael," the prayers with a Danish translation (ib. 1856); "Aufgefundener Briefwechsel Zwischen einem Hochgestellten Protestantischen Geistlichen und einem Rabbiner" (first in "Ben Chananja," 1860, and then in book form with additions and corrections, Leipsic, 1861); "Lærebog i den Israelitiske Religion" (ib. 1861); "Bibelhistorie for den Israelitiske Ungdom" (ib. 1862); "Bibelhistorie for Skole og Hjem" (ib. 1867); and "Talmudfjender" (ib. 1878). He also made a Danish translation of the Pentateuch, which was published on his ninetieth birthday. idem, in Ha-Asif, vi., part 1, pp. 147-148.